2035 Regional Gate Down time. PSRC. Last week — by sheer chance, the day an oil train (harmlessly) derailed in Interbay — the Puget Sound Regional Council released a staff report on the transportation and economic impacts of the Gateway Terminal, a proposed bulk-goods export terminal at Cherry Point, near Bellingham. This facility would primarily serve to transport coal from Montana to China, using BNSF’s rail lines to cross the northwest, and the bulk of this study is focused on impacts to road users of increased rail traffic on BNSF’s Puget Sound lines. In general, I don’t have much to add to the Gateway debate (I think building it would be an appalling mistake, on the basis of coal’s global climate impact), but there are a couple of nuggets about Washington’s rail infrastructure that are important to the state’s future regardless whether or not the Gateway Terminal gets built. First, “gate-down time” — the average amount of time, per day, that road users will be delayed at grade crossings — will rise significantly throughout the region due to the coal-induced increase in train traffic associated with Gateway. The impacts will be particularly severe in railroad towns with many grade crossings, such as Marysville, Auburn and Puyallup. 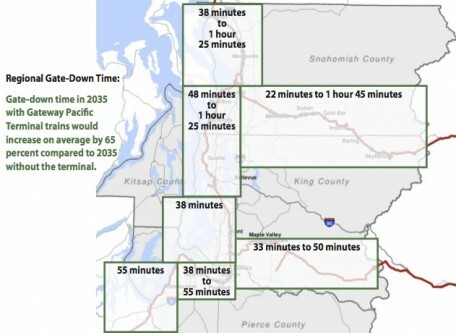 Second, even if Gateway is not built, freight traffic is expected to reach similarly-problematic levels of gate-down delay by 2035 (as shown in the graphic above), simply through secular growth in economic activity and shipping. One obvious conclusion is that if Washington had a rational state transportation policy, WSDOT would be busy building overpasses and underpasses at high-impact crossings, both in Puget Sound and around the state. We don’t have such a policy, of course, as the pathetic pavement quality on I-5 in King County testifies every time I drive on it, but along with taking a “fix it first” approach to highways, a sensible statewide transportation policy would include a grant fund to help localities pay for grade-separation projects needed to keep their roads working. PSRC has helpfully studied all the crossings in our region, and identified 34 high-priority individual grade-separation projects, at $50-$200 million apiece. This would be a great list for the state and region to start working on, but I’d like to see a little more ambition in certain areas. Between Everett and Marysville, in particular, the existing BNSF trackage is characterized by tight curves, extremely old bridges, and an extraordinary number of grade crossings, all of which impose frustrating speed limits on passenger trains, and degrade the safety and quality of life in the surrounding neighborhoods. A real commitment to the state rail network might include replacing that section of track with new river crossings and full elevation through Marysville. Luckily that Interbay crash was harmless! Coal trains are the least of our worries. If anything these numbers underestimate the growth of freight traffic. Every time the cost of diesel fuel increases the cost advantage of railroads increases over trucking. Just in the past year several manufacturers in the Portland area have relocated to other parts of town due to better track access. +1. Fuel costs will inexorably rise, and freight rail will just gain further competitive advantage as it does. Building more rail infrastructure should be a much higher priority than it is. Keeping us competitive with an improved Panama Canal (or even the proposed Nicaraguan Canal), Prince Rupert, and Long Beach would require quick and decisive investments in the grade separations you mentioned, a minimum of double track where possible systemwide, crown-cutting and signalizing Stampede Pass, building the Ellensburg-Lind connector, and many other small projects. Sadly, we don’t really seem to care that much, and as a state we’d rather agitate for new highways. The cheapest, easiest, fastest thing to do that would increase capacity as well as reliability of the Cascades passenger trains is undercut the Point Defiance tunnel, drop the track three feet, and return it to being a double track line through the tunnel. Lets face it, these trains are long and heavy. They will be coming up the Columbia River and north through Centralia. The water level route is vastly cheaper , so BNSF is not going to run these through the Cascades when they don’t have to. Washougal will have a slowly moving steel wall going through it most of the night. That doesn’t really matter much to passenger trains, does it, since they’ll be using the Pt. Defiance bypass from 2017. It’s still in BNSF’s (and UP’s) interest to do it on their own dime. Traffic that backs up waiting to get into the single track section spreads out pretty far sometimes. Do we really want to spend multiple billions of highway tax dollars to build grade separation so that BNSF can transport coal and oil to China? If 34 grade crossings are upgraded at an average cost of $75 million per crossing, we would be spending over $2.5 billion just to make BNSF’s trains move faster. Is that really the best use of highway construction money? Yes, Bruce, I read the post and the PSRC study. I’d like to see guarantees that high(er) speed passenger rail would be given access to the corridor if the crossings are separated and that passenger trains would be given priority if the State is going to spend billions on grade crossing improvements. If the Gateway project is going to be green-lighted, I would like to know that the impacts down-line are going to be mitigated and that the cost of mitigation is going to be shared by the public and BNSF. If the State is going to pay for the upgrades and BNSF is going to pocket the profits, I’d say it’s a bad deal. Then yes, I agree with having BNSF contribute, and guaranteeing passenger service priority on the line. The freight railroads published numerous studies in the early 2000s that predicted straight-line traffic growth in the coming years. Those predictions failed to materialize and where traffic did increase, it was mostly in areas that weren’t predicted by the studies done in the early 2000s (Bakken, for example). I’m all in favor of prioritizing and upgrading freight and passenger rail corridors, but I also know that there aren’t billions of available dollars to throw at those projects. Naive extrapolation is easy, projection of industrial geography is hard. Hmm, i think its time that WSDOT revive this program from a few years back except for even more rail crossings. See this link for an old document on it..
Grade separation benefits everyone involved over the long run, not just the railroads. One alternative though in Marysville if you look at the map, would be to run a brand new rail line angled NW that would go up to the Tulalip Reservation behind the Outlet mall and the casino and meet up with the existing BNSF Line around 140th-152nd .Though this idea would be a nightmare from a property acquisition standpoint. It would take the entire line out of Marysville completely which could than be used for an extension of Sounder North all the way to Arlington. I was thinking of a new line, bypassing the Delta yard and the rickety old swing bridges west of I-5. Start from around 22nd St in Everett, run east of I-5 up to Marysville to the existing alignment. From there, elevate the line up through 88th St, and put 116th and 136th St in underpasses. This reduces the grade crossings to a reasonable number, and I think the ROW would be reasonably easy to obtain. Sounder North should have died years and it it really should die once Lynnwood Link is up and running – the money saved by not running north Sounder could buy as many non-stop bus trips as necessary between the existing Sounder Stations and Lynnwood Link Station, and still leave money to spare. Building new rail lines will require new bridges across the rivers. The existing bridges on the existing rail line are terrible bottlenecks, but building new lines and new bridges won’t be easy. The area east of I-5 is a highly sensitive flood plain and building in that area would be difficult. The idea of building through the Tulalip area would be possible if the Tulalips could be convinced that a railway would provide a net benefit for the Tribe. I imagine the Tulalips would want a passenger station built in the area of the Outlets/Casino. But, would a new station balance the potential threat of oil and coal trains passing by all day and night? Doubtful, and that’s going to be a huge obstacle in the future–no community is going to want toxic cargo passing through their neighborhoods 24/7. Moving the existing rail line will be an almost impossible task. I played a staff role in the FAST Corridor project that built a string of grade separations between Everett and Tacoma. My primary take-away from that experience was that whenever transportation agencies or modes intersect, everyone scurries to escape being responsible for expensibve solutions. For railroad-roadway intersections that dynamic is exacerbated by public agencies’ concerns about using tax dollars to support private purposes. For the FAST Corridor, the breakthrough occurred when we agreed on a funding formula that all parties could live with, and with that in hand we gained significant success in state and federal funding. I see this dynamic play out over and over. My favorite current example is the ped/bike overpass needed to make the Northgate Link station accessible to the North Seattle College across I-5. All parties stand to gain if it’s built, but no agency wants to claim cost responsibility. These are the kinds of situation where leadership is needed to bring people together and find solutions — absent that, these are the parts of the transportation system that get neglected. Unfortunately some flexibility to make deals is also a requirement for partnerships, something that most public agencies don’t have these days. You are correct. FAST was a good program, but without any real funding and advocates it languished. I’m still waiting for the City of Seattle to do the Lander and Broad Street Grade Separations….However a number of communities south of Seattle actually did stuff. City of Everett built several bridges over BNSF tracks. Everett Bridges: BNSF is going to have to rebuild or replace these in the next 20 years. They are about 100 years old now and have serious speed restrictions on them. That whole area is a serious capacity constraint due to low speeds. It takes a long time for a freight train to clear at 20 mph. Fixing the bridges and increasing speeds would reduce the gate down times in Marysville, and hence the traffic impacts. How come suddenly people are concerned about gov subsidising private venture. Gov has subsidised transport for private users since the founding of this country. Both from an environmental perspective and a convenience perspective I think rail investments make sense. I’m tired of being on Amtrak stuck behind malfunctioning freight trains. I figure I’ll jump on here and add some input. First of all, this stuff about Sounder North isn’t going to go away nor is the train going anywhere in the next 20+ years. As much as you all may want it to disappear, it won’t. The equipment in the future may change but otherwise, what you see is what we get to enjoy now well into the future. In terms of the fear mongering regarding increased freight traffic; Traffic levels, EVEN with the added coal AND oil trains, PLUS the extra trains that BNSF/CN will begin running soon, is no where near the 2006 traffic levels. Another 45 trains will need to be added, then these scare tactics of OMG, MILE LONG TRAINS! Can be justified. A bit more reality for a lot of you – The State could care less about the Amtrak Cascades service in terms of coughing up money for rerouting trains. It’ll never happen without some one stepping up to the plate and getting the money for them. They are not going to make a valid effort without it. Period. That is exactly why we have only been at 6 r/t’s to Portland and only increasing to 8. It isn’t because of BNSF at this standpoint, it is all WSDOT. Lastly, again, regarding train speeds – Most of us (BNSF employees) make a very hard effort not to tie up and block Downtown Seattle, myself especially. Sometimes traffic happens, sometimes there is a bunch of maintenance work going on that doesn’t allow us to do track speed (25mph Broad Street to Royal Brougham, 35mph after the end of the train clears both points) but we don’t like tying up traffic anymore than sitting behind the wheel and getting stuck behind one. With all of that said, WSDOT and SDOT need to pony up the cash if they want grade separation/crossing eliminations. The City/WSDOT, depending on the crossing, are the ones responsible for the crossing, excluding the maintenance. The FAST program did most of the South corridor (Royal Brougham to the Port of Tacoma) overpasses and they have worked out very well. It is a shame that Holgate, Lander, and Spokane Streets weren’t done because of the City of Seattle’s unwillingness to supply the missing holes for funding like the rest of the cities did. At least a dozen auto carriers were ripped open, with the steel decking hideously warped and even torn, Fortunately for the UP it appeared that all were empties, so no cars were damaged. But, had they been tank cars carrying crude oil the Columbia would be a mess!